Do you ever stop and wonder how hot it would have to get before you could legally down tools and head outside to enjoy the sunshine? Unfortunately, in most cases, it’s a myth that you can do this despite campaigns from both the TUC and MP’s. The HSE has previously defined thermal comfort in the workplace, as below 30°C (86°F) for sedentary activities and much lower for more strenuous work activities. The Workplace (Health, Safety and Welfare) Regulations 1992 state that during working hours, the temperature in all workplaces inside buildings shall be ‘reasonable’. However, to control the temperature in a kitchen area or a cold store is obviously impractical but according to the HSE, when it’s very hot in an area where employees spend long periods of time employers should take all reasonable steps to achieve a comfortable temperature. This could mean insulating hot pipes, providing air-cooling equipment, shading windows or moving workstations to cooler areas. If this doesn’t work, and in extremely hot weather, then local cooling, fans or increased ventilation may be used. If workers are still exposed to excessive temperatures then suitable protective clothing and rest facilities should be provided and where practical, systems such as task rotation should be introduced to reduce the time individual workers are exposed to uncomfortable temperatures. However, it’s not until 10% of staff in an air conditioned office, 15% in a non-air conditioned office or 20% in shops and warehouses have complained about the temperature, that an employer is legally obliged to carry out a thermal comfort risk assessment and then take further action depending on the results. The Hot Topic Of Workplace Temperature. The only certainty about the UK’s weather system is that it’s very unpredictable and whether we’re experiencing extended winter temperatures in spring, long periods of lashing rain in summer or a rare blast of sunshine in autumn, nothing really surprises us anymore. This means that our vulnerability to extreme weather is much greater than it used to be, and in recent years, parts of Britain have experienced heatwaves in March and heavy snow in May! This extreme weather makes the temperature within buildings very difficult to control from one day to the next. 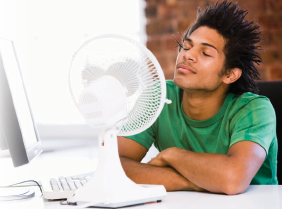 Working indoors can be a drag during the summer months and as temperatures go up, your concentration levels go down. So in order to remain productive and alert, and also reduce the chances of an accident, it’s important that your workplace is a comfortable temperature. However, for many organisations investing thousands of pounds and facing the disruption of installing a full air conditioning system is an unrealistic prospect, especially when it would only be used for a few months each year, so other more temporary and cost effective cooling options can be considered. Equally if your workplace is too cold, then alternative forms of heating could be considered along with other ways such as increasing insulation or providing warmer PPE to make working conditions more bearable. Whatever the size of your business there are many changes which can be made to make your workplace a better place to work, which in turn will increase the morale and health of your employees, therefore reducing staff turnover and sickness levels. Take a look at the following product highlights, which illustrate the main differences between the types of cooling products on offer. With the help of the “Your Guides” on the relevant pages you can establish which product would be most appropriate for your needs. Desk Fans- A wide range of fans suitable for spot cooling. They are available in a range of sizes and strengths and so can be used from small offices to industrial environments. Air Coolers - More powerful than a standard fan, but can still be used for spot cooling. Air coolers use water to cool the air, and therefore do not dry out the air in the atmosphere whilst cooling. 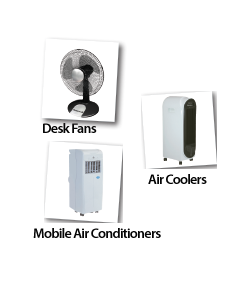 Mobile Air Conditioners - Portable air conditioning machines have the benefit of being an extremely powerful cooling system but are more cost effective than implementing site wide air conditioning. Can be used for spot, or comfort cooling of an area. Many have dehumidifiers and thermostats included. Many workplaces constantly have to deal with hot conditions, no matter what the temperature is outside. Employers within these environments need to ensure that employees are aware of how to work safely in heat, the factors that lead to heat stress and how to reduce the risk of it occurring. An inability to concentrate, muscle cramps, heat rash, severe thirst and fainting, all of which can lead to heat exhaustion or heat stroke. Work rate – the harder someone works the more body heat they generate. Working climate – this includes air temperature and the effects of working near a heat source. Worker’s clothing and respiratory protective equipment – may mean that the body is unable to regulate its temperature. Worker’s age, build and medical factors. Control the temperature by using fans or air conditioning. Provide mechanical aids where possible to reduce thework rate. Regulate the length of exposure to hot environments. Provide rest breaks in cooler conditions with access to cold water. Provide PPE made from breathable material. Monitor the health of those at risk or who may be most vulnerable due to illness or health conditions.